This last Christmas I volunteered to do dessert for 3 epic family gatherings. I did it for rather selfish motives- so that my paleo kiddies could eat all of the dessert without restrictions. Dessert is hard to compromise on as almost all desserts have refined sugar in them. And another platter of fruit only goes so far when trying to make the children feel like they are actually having dessert. There was pay back for my decision to make all the dessert- it was a LOT of work! However these little bits of yumminess were so easy to make and the kiddies loved them. They are so simple to make that I am not even going to post a recipe! They are fantastic paleo summer treats and almost all the non-Paleo’s loved them too. Cut bananas into 5cm chunks and stick a cake pop stick/ popsicle stick/ lollipop stick into each chunk. Freeze the banana chunks. Melt chocolate with a little bit of coconut oil and dip the frozen banana chunks into the chocolate- it will set pretty quickly so is virtually mess free. Store the banana pops in the fridge until ready to eat. I used 85% pure chocolate for the dipping. This was too bitter for my nephew who is not used to refined sugar-free at all. Use a bar of chocolate that is 70% pure in this case as it will be sweeter. For a 100ml bar of chocolate add a tablespoon of coconut oil- this makes the chocolate mix more pourable/ spreadable. I dipped the banana twice in the chocolate mix- this gives a nice thick shells. 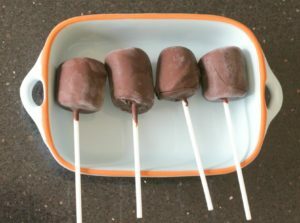 Take the banana pops out of the fridge 10 minutes before serving. Otherwise the banana is frozen rock solid! 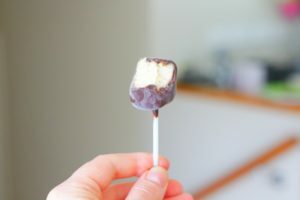 I have a little stash in the freezer to hand out after dinner and they are a fabulous substitute for the popsicles and ice creams on a stick we used to have!